As well as supplying all sizes of balers, we also supply the consumables which hold a bale together. The binding can be made of baler twine, bailing wire or tape, all of which we supply to fit all types of balers. For mill size bales, galvanised baling cut and loop baling wire is required, which we also supply. Baler wire comes in either 14 or 17 feet lengths, with a loop at one end for tying off the bale. We supply this in 25kg bundles and each bundle contains enough wire to make approximately 20 bales. Bailing wire can be supplied in galvanised wire, which is a particularly clean and strong option or, alternatively black annealed mild steel can be provided, which is manufactured to BS1052. Phoenix supplies baler twine in boxes of 8 x320 metre reels. We also offer heavy duty plastic sacks to fit Orwak, Kenburn, Bergmann, Pottinger and Tony Team bag packing machines. At Phoenix, we pride ourselves on our customer service and aim to have any deliveries direct to your site within 24 hours. 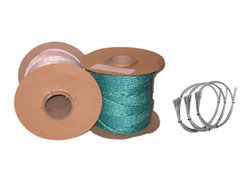 For our latest baler twine and bailing wire prices, call us now on 01708 550641 or email us.